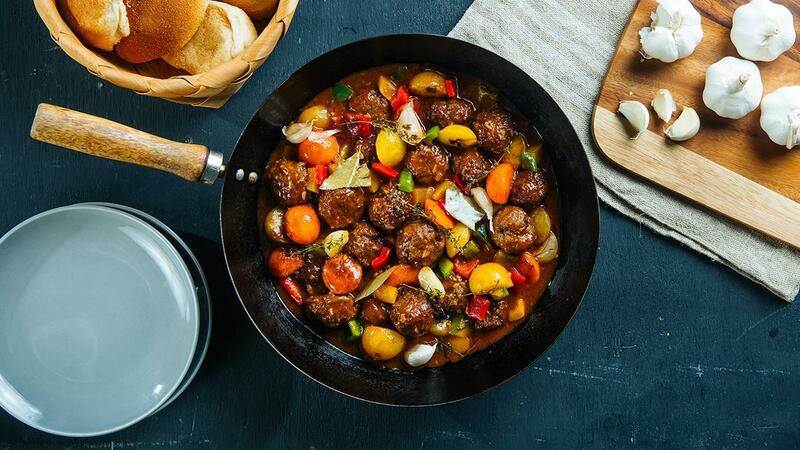 This Kaldereta is made special by using tender meatballs made with a combination of pork and beef. Guests will enjoy this with a bowl of hot rice! For the meatballs, combine everything in a bowl and form balls weighing 25g each. Flash fry in hot oil, then set aside. In a sauce pot, sauté the onions and garlic until fragrant. Add the tomato paste and liver spread. Continue to stir while adding the water, tomato sauce and Knorr beef broth. Bring to a boil then add the cheese. Mix well and adjust seasoning if necessary by adding Knorr Rostip Seasoning Powder. Add the meatballs and continue to simmer for another 10 to 15 minutes. Transfer meatballs onto prepared bowl and add vegetables on top. Serve immediately.